Dundee FC in the Community trust are proud to be the main beneficiary of an Charity Gala being hosted on March 3rd. 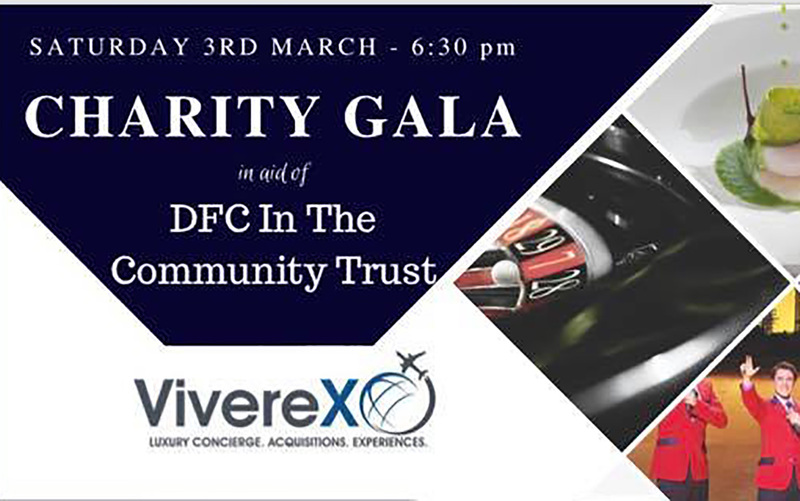 Please join hosts Vivere-XO and the Old Course Hotel St. Andrews Golf Resort & Spa for an event unlike anything you’ve experienced before, and help us raise funds in support of DFC in the Community Trust. Amongst the excitement and surprises throughout this black tie evening, guests will also enjoy a champagne drinks reception with canapes and a three-course meal prepared by Executive Chef Martin Hollis; a mesmerising magician, live entertainment from The Jerseytones, an auction featuring once-in-a-lifetime experiences and bespoke items, and gaming hosted by Grosvenor Casino that’s sure to result in more than a few winners – along with other surprises thrown in for good measure! 2) Private hire of a 5litre turbocharged brand new Jaguar F Type for a long weekend. This is a £90k car (Winner must be 26 or over with no more than 6 points). Overnight stay for up to 10 couples at the incredible exclusive use 5* Turin Castle just outside Forfar, with a taster menu from the award winning, chef to the stars John Watret. There will be lots of surprises thrown in; expect butler service from a head butler to many an A lister, fine food and drink tastings, entertainment and laughs to last a lifetime. This prize is worth over £20k!!! And is not something that anyone has access to. Turin Castle has been featured in the likes of The Rob Report, BBC etc, and John Watret has cooked for everyone from the King of Spain to the Guggenheims. This really is a prize not to miss! The castle has 10 rooms, with a maximum capacity of 20 people. For good measure, Pentland Perth have also thrown in a brand new Range Rover Velar for guests to explore the countryside with if they wish.